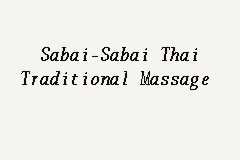 SabaiSabai Thai Traditional Massage is a Spa located in Subang Jaya, Selangor. If you would like to know their latest promotion, call them at 6016363 3812. People who don't make use of this form of treatment are crazy and are doing themselves a huge injustice. I feel fantastic.